An in-depth study of the work of the Holy Spirit today. There are so many conflicting ideas on the Holy Spirit, it is hard to know what to believe. This study takes us back to the Bible and lets the Bible show us the Spirit. 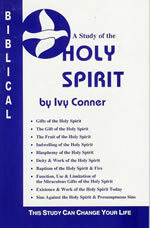 Includes chapters on Gifts of the Holy Spirit; The Gift of the Holy Spirit; The Fruit of the Spirit; Indwelling of the Holy Spirit; Blasphemy of the Holy Spirit; Deity and Work of the Holy Spirit; Baptism of the Holy Spirit and Fire; Function, Use and Limitation of the Miraculous Gifts of the Holy Spirit; Existence and Work of the Holy Spirit Today; Sins Against the Holy Spirit including Presumptuous Sins. the Bible interpret the Bible. Bible Study Books by Ivy.com offers a variety of Bible study materials. The books and studies by Ivy Conner are easy to understand and simple to use and will help you let the Bible interpret the Bible as you study. Ivy's goal is to "speak where the Bible speaks..." There are Bible study books you can order and printable books you can download. Looking to improve your quality of life? There are books and tapes that can help you build a personal development plan based on the positive, upbeat principles of the Bible. The Time Management album shows you ways to restructure your time to gain 1,000 hours a year to focus on your priorities. To give you a lift or a little inspiration, sign up for a free e-mail each week with a positive quote or a short article along with any specials that are available. FREE quote cards of positive sayings or Bible scriptures, and FREE articles can be copied at no charge. Choose from a variety of Bible versions of the Thompson® Chain Reference® Bible. The most widely respected and highly-acclaimed Study Bible for more than five generations, this Bible offers you every basic tool you need for an in-depth study that is matched to your specific needs and personal interests. The unique chain reference system grants you immediate access to every key reference, significant theme, topic, person and place discussed anywhere in Scripture. Your Thompson® Bible is "influence-free," because instead of commentary, the margins are filled with thousands of chain-references® that propel you ahead into Scripture. Scholars agree that the Bible is its own best commentary, and no other study Bible helps you go deeper into the Scriptures than a Thompson® Chain-Reference® Study Bible. FREE inspirational thought or message to be sent to your email each week along with specials or new product announcements. To ensure that our email newsletters will get to you safely, please add the email name biblestudybooksbyivy@earthlink.net to your address book. Emails entered are never shared and will only be used to send you the weekly newsletter, Ivy's Clippings.